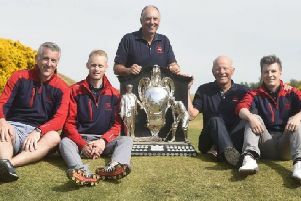 Kingsfield Golf Centre’s annual charity event will be in memory of legendary Lothians caddie Dave Renwick this year. Stephen Gallacher and his caddie, Damian Moore, have selected Pancreatic Cancer Scotland as the latest Katie’s Cup charity after Renwick recently lost his battle with that illness. “Stephen and Damian both do so much for the Katie’s Cup and letting them choose the charity for this year was our way of thanking them for their support,” said Kingsfield owner Robert Arkley. The popular event raised a record £22,100 last year, the money being split between Children’s Liver Disease Foundation and breast cancer charity, Bosom Buds. “The funds raised will provide support for families who have children with liver disease and towards research, as many liver diseases still have no cure,” said Linda Simpson, a volunteer for the Children’s Liver Disease Foundation. The figure took the total raised from five Katie’s Cup stagings to £55,000.